Tour the Pantanal in Brazil to seek South America’s “Big Five” - jaguar, giant anteater, giant otter, ocelot, and South American tapir. Travel via boat, bus, and safari vehicles through regions where marshes, lakes, and streams provide diverse ecosystems that foster superb wildlife encounters with these awe-inspiring mammals. Journey down the famous Transpantaneira Highway in the northern Pantanal to Porto Jofre where day tours on the Cuiabá River afford numerous opportunities to see jaguars, giant otters, and other wildlife not easily seen by land. While in the southern Pantanal, stay at Caiman Lodge, a top wildlife destination in Brazil, and also a sure bet for giant anteaters and ocelots. Also learn about conservation and wildlife research from biologists as you join them in the field. 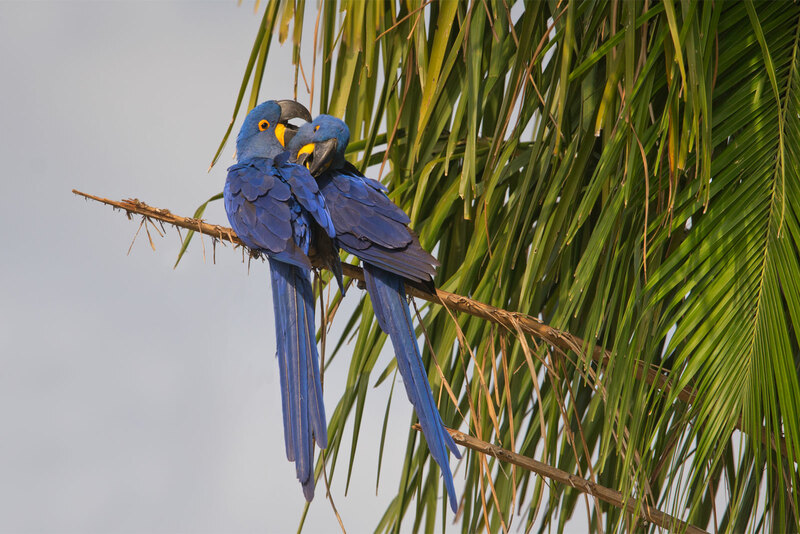 Find a plethora of beautiful birds, such as the hyacinth macaw, to photograph and enjoy. The Pantanal Conservation Complex is a UNESCO world heritage site and biosphere reserve of spectacular beauty. • Boat down river to spot jaguar cooling off on the banks, keeping an eye on the water for giant river otters. • Head out at night with our leader to search for nocturnal animals such as the ocelot, giant anteater, South American tapir, and Yacaré caiman. • View the prehistoric-looking jabiru stork and the world’s largest parrot, the hyacinth macaw, along the Transpantaneira Highway. • Join conservation researchers in the field and learn about conservation issues faced in this region. Aug 3 Travel to Brazil. 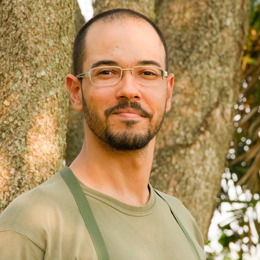 Diogo studied Biology at Bahia Federal University, one of the most renowned academies in Brazil, and began working as a naturalist guide in the Pantanal region in 2011. His skills in zoology, animal behavior, botany, animal tracking, ecology, birding, and photography have propelled his career in guiding for renowned lodges, safari groups, and research programs. 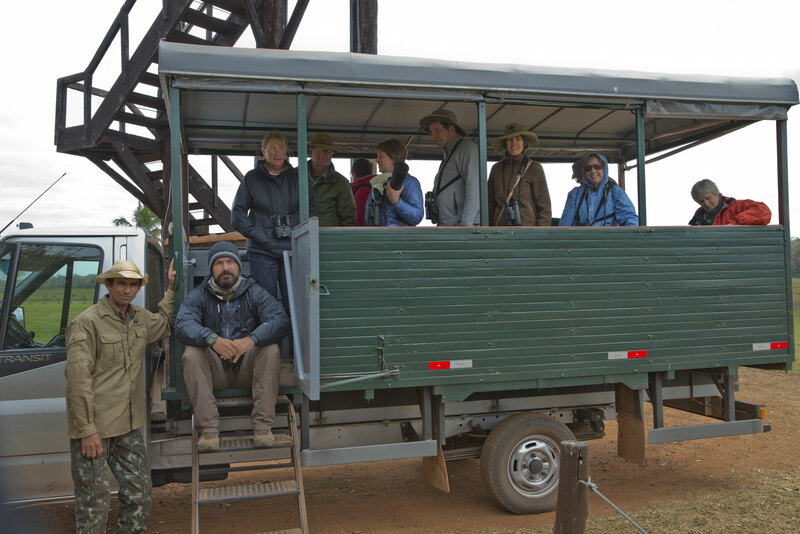 On safari, Diogo aspires to build a bond between travelers and nature and instill a commitment to conservation by sharing his experiences, knowledge, and love for the region. We recommend arriving in São Paulo today. We will book you an overnight at a hotel near the airport at an extra cost, which includes the transfer from the airport on August 3 and back to the airport on August 4 for the flight to Cuiabá. Arrive in São Paulo by early morning today at the latest. Diogo will meet you at the São Paulo Airport to catch the mid-morning flight to Cuiabá located in the northern part of the state of Mato Grosso. Drive across 90km of the Cerrado region (Brazilian savanna) to the town of Poconé, then drive about 15km south to the entrance of the Transpantaneira “Highway” - a truly extraordinary gravel road traversing some 150km of the Pantanal. You will continue south down the Transpantaneira to Araras. Explore the grounds of the Araras Eco Lodge, which include 3,000 hectares of wetlands, forest, and savannah. Birds, such as the cinereous-breasted spinetails and Mato Grosso antbirds, can all be found in the woodlands around the lodge and along an elevated boardwalk. 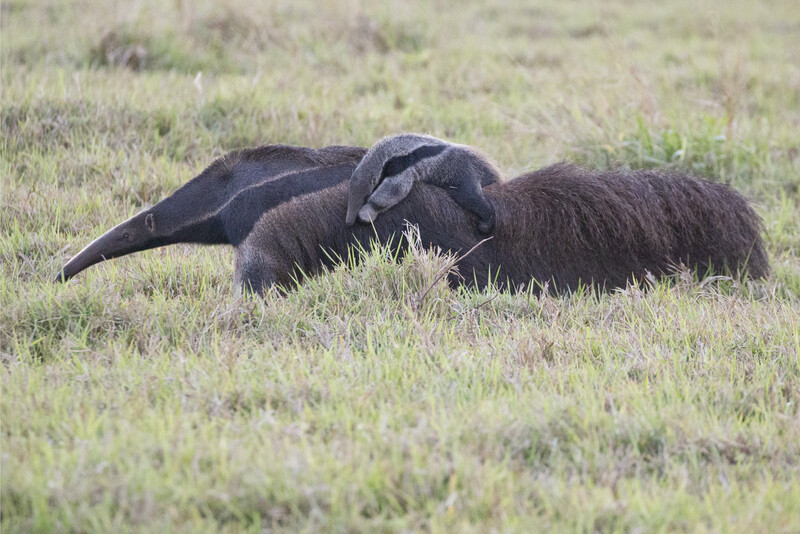 The Araras property extends east of the Transpantaneira into the dry grasslands where you have a great chance to view both lesser and giant anteaters. After dinner, you will go on a night drive, the best time to encounter tamandua (also known as the lesser anteater) and perhaps a South American tapir. After an early morning safari at Araras, you’ll journey south down the Transpantaneira Highway to the Cuiabá River in Porto Jofre, making stops along the way. Water lingers alongside the Transpantaneira, concentrating a wide variety of wildlife. Diogo is very familiar with this area and knows some excellent places to stop to stretch your legs and take photographic opportunities. The principal avian emblems of the Pantanal are the jabiru stork standing five feet tall and the hyacinth macaw, the world´s largest parrot. The hyacinth macaw is usually near lodges where they easily steal the show while feeding on palm seeds. 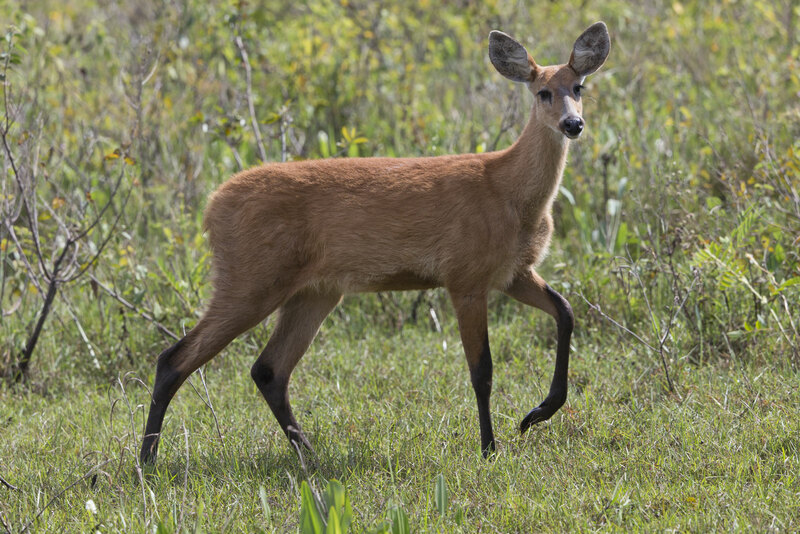 Two species of brocket deer, plus pampas and marsh deer, can sometimes be seen in the tall grassland. The best chances to spot jaguar are on the Rio Cuiabá. The jaguars in this region are protected for their conservation and have become accustomed to boats full of photographers pointing lenses at them. You’ll ride in boats that can quickly reach the various tributaries of the Rio Cuiabá where the cats may be lounging or hunting. The boat will travel slowly as you scan the banks and vegetation for signs of jaguar. You'll enjoy morning and late afternoon private boat trips when the sun isn’t directly overhead. Besides the beautifully colored birds, mammals to keep an eye out for include black-striped tufted capuchins, the crab-eating fox, South American tapir, and the enigmatic ocelot. Hundreds of Yacaré caimans and some green iguanas are the most noteworthy reptiles throughout the Pantanal. If lucky, you may come across a rare yellow anaconda. Start today with another morning boat trip. 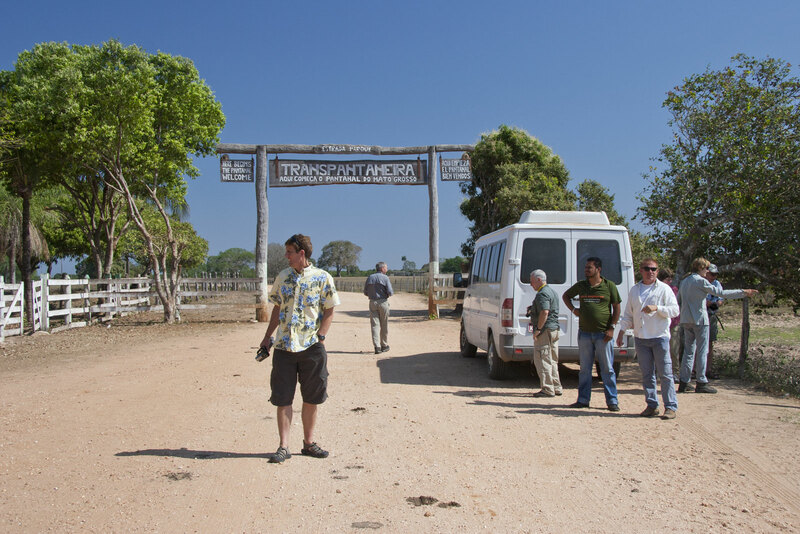 After lunch, you will take a charter flight to Campo Grande directly to Fazenda San Francisco, a working ranch and hub for ecotourism and conservation research. There will be time for game drives and exploring today. You’ll have your best chances of finding giant anteater and ocelot on game drives and during nightspotting in this area. Even jaguar, maned wolf, and South American tapir are sometimes encountered. Fazenda San Francisco has extensive native forest, wetlands, and grasslands, but it’s also a working ranch with cattle pastures and vast rice fields. The owner and staff work very hard to preserve wildlife, particularly to protect the rare mammals. Blue-and-yellow macaws, parrots, parakeets, toucans, and toucanets are plentiful right around the lodge and are extremely habituated. You’ll go on a game drive in the evening and at dawn for the best action and enjoy breaks on the lodge grounds during the warm part of the day. Continue your search for more magnificent birds and charismatic mammals of the southern Pantanal region. In the afternoon, you will travel to nearby Fazenda 23, another remote working ranch with abundant opportunities for wildlife encounters. With a base at Fazenda 23, the Wildlife Conservation Society (WCS) has formed a partnership with the surrounding rural community to protect the biodiversity of the Pantanal. The ranch’s sustainable practices have contributed to the high diversity of wildlife you will see as you tour the area. Local researchers from WCS will show you the conservation work they are doing in the region, especially their work on the critically endangered white-lipped peccary. Take another early morning game drive before heading to the famous Caiman Lodge. Caiman Lodge, which is “best of the best” of nature lodges in South America, has charming accommodations, a very experienced friendly staff, delicious food, very high-quality service and best of all, amazing wildlife! You’ll begin your explorations in the beautiful surroundings for birds and other wildlife. This is our favorite location in all of the Pantanal. You’ll also enjoy night drives to spot nocturnal wildlife in action. 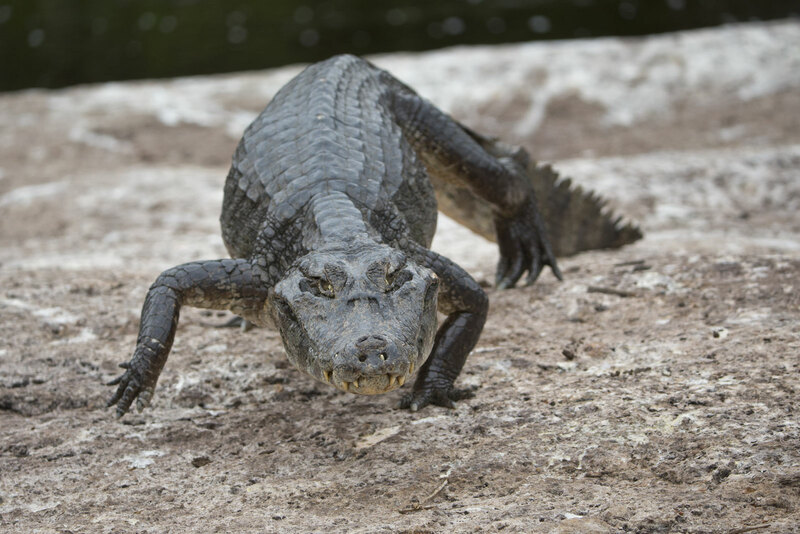 You have good chances for locating jaguars, but the overall wildlife experience while immersed in beautiful native habitat is the highlight here at Caiman, named for the plethora of Yacaré caimans, who peer out with their beady eyes gleaming at night. With luck, you will encounter mother giant anteaters with young on her back, gray brocket deer, pampas deer, two species of armadillos, tapeti (Brazilian rabbit), plus crab-eating raccoon. Elusive wildlife is very challenging to photograph, so ample time will be spent in the field to be sure to get some great photographic results. Spend the last morning photographing the resident macaws and other photogenic species. If the light is not ideal, or the group prefers, you can take a drive to the river for some action there! You’ll transfer as a group to the Campo Grande Airport for your flight to São Paulo and then homeward. Depending on your flight schedule, arrive home today. Tour Brazil to seek South America’s “Big Five” – jaguar, giant anteater, giant otter, ocelot, and South American tapir. Costs are per person, double occupancy, not including airfare (except charter flight between Porto Jofre and Fazenda San Francisco), singles extra. See Included and Not Included sections for more details. All leaders, transport, park entry fees, vehicles, and boat trips for all activities described in the detailed itinerary. Charter flight between Porto Jofre and Fazenda San Francisco. Accommodations for the nights of August 4 through August 18. Meals from dinner on August 4 through breakfast on August 19. All airfare, except flight listed as included, including international and two internal group flights booked by Cheesemans’ Ecology Safaris, airport and departure taxes, and excess baggage fees. Airfare is approximately $1,000 to $1,500 round-trip from the continental US, plus about $350 for two internal flights. Gratuities: tipping is, of course, discretionary, however we suggest budgeting about $25 to $28 per participant per day for August 4 to August 18 with our guides (about $375 to $420 total per participant). Items of a personal nature such as laundry, telephone calls, medical costs or hospitalization, room service, soft drinks, and alcoholic bottled beverages, and items not on the regular menu, etc. If you have special dietary needs, please indicate them on your Reservation/Release Form. The Pantanal can be very hot, from 90 to 100+ °F (32 to 38+ °C), especially during midday and afternoons. Stormy, windy weather from the south can make boating on the rivers very chilly, in the 60s °F (~15-20 °C), so plan to layer clothes to be prepared for these drastically changing conditions! Most wildlife viewing is done from small boats and vehicles. Walks to search for wildlife are generally less than an hour over relatively flat trails or along the gravel roads. All airfare, except flight listed as included, is not included in trip costs. Detailed flight information and the contact information for our recommended flight ticketing agent is included in the Trip Materials we will send after we receive your reservation; she can help you arrange your flights. Please let us know if you are arriving earlier or staying later. Flights you (or a travel agent) book: Arrive at São Paulo – Guarulhos International Airport (GRU) early enough to connect with a morning flight to Cuiabá, Brazil (CGB) on August 4. We recommend arriving a day early for an overnight to guard against flight delays or cancellations. Depart from São Paulo – Guarulhos International Airport (GRU) in the late afternoon or at night on August 19. Flights we book for you: Three internal flights (São Paulo to Cuiabá, Porto Jofre to Campo Grande/Fazenda San Franciso, and Campo Grande to São Paulo). The cost of the Porto Jofre-Campo Grande charter flight is included in the cost of the trip; the other two internal flights will be added to your final trip balance. Should I visit the Pantanal or the Amazon to see wildlife? While the Amazon is much more famous, the Pantanal is the best place to see Brazil’s wildlife. The Pantanal is the world’s largest wetland and attracts many large mammals (the Big Five), smaller mammals such as monkeys and capybaras, beautiful birds, and has much greater biodiversity and a higher density of that biodiversity. We prefer the Pantanal for our wildlife safaris. When is the best time to go to the Pantanal? We tour the Pantanal in August and September during the dry season. Wildlife tend to concentrate around the ponds left after the wet season’s floods. Fields are now dry, enabling us to hike and drive safari-style through them to look for wildlife. 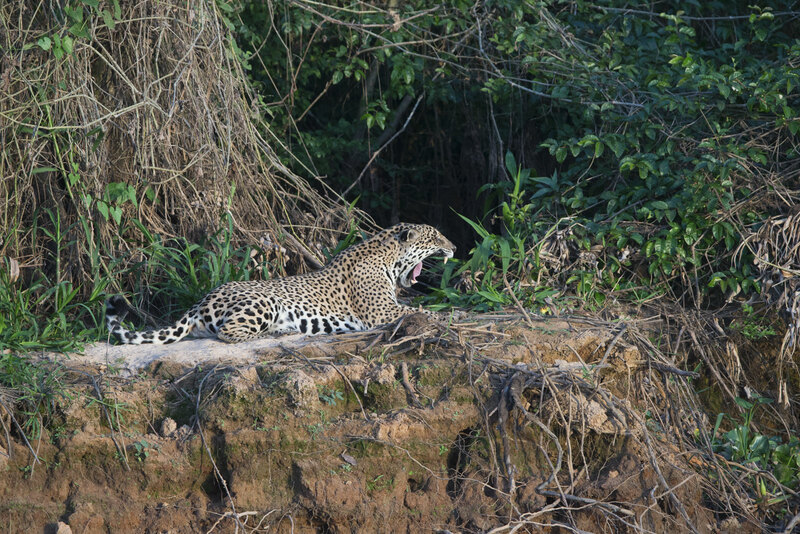 It is also warmer (but not too hot for us yet) during these months and the coolness of the river entices jaguars to the riverbanks to cool off. August and September are also good months to see plentiful birds. Am I guaranteed to see the Pantanal’s Big Five - jaguar, giant anteater, giant otter, ocelot, and South American tapir? Our goal is to see the Big Five, but we cannot guarantee that we will see them all. Wildlife is wild and unpredictable. But to best meet our goal, we spend the maximum time possible in the field to greatly increase our chance of seeing the Big Five and lots more. Why do you spend so much time on rivers in the Pantanal? 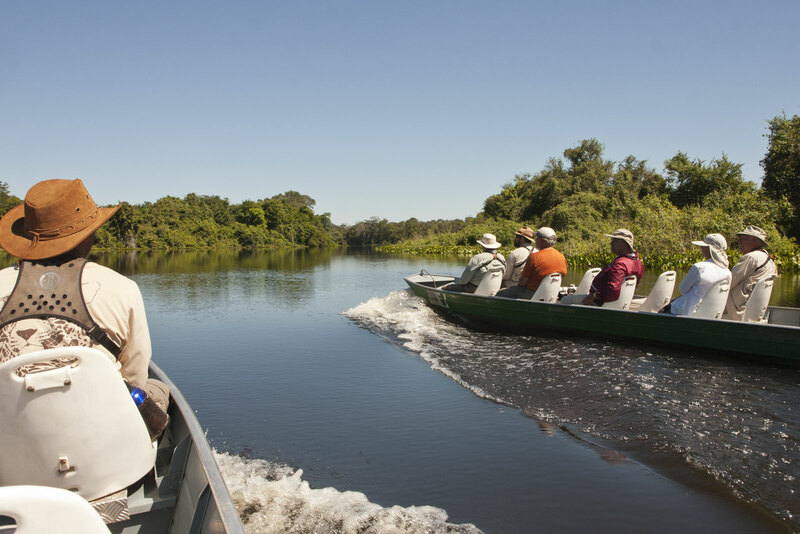 During days near the Cuiabá and other rivers, we spend a lot of time in boats since that is the best way to see jaguar and other wildlife along the riverbanks. Wildlife are accustomed to tourist boats and feel safe around them, generally allowing us to approach close. The boats have limited space, but you will have room near your feet and on your lap for your daypack and camera gear. The boat seats are comfortable with back rests. We usually go out early in the morning, return for lunch, and go out in the afternoon again, perhaps returning late. Should I worry about seasickness on the Pantanal’s rivers? The rivers in this region are calm and we have never had problems with anyone getting seasick. All lodges have private baths and air conditioning. Travel will be by mini-bus, boat, and commercial air. The mini-bus is air-conditioned. Some remote roads in the Pantanal can be unpaved, dusty, and bumpy. Some of the drives between regions are long, between one and five hours, but most of these are on paved, modern roads. The boats are comfortable and easy to board and unload. "An eye opening adventure that I will cherish for the rest of my life."